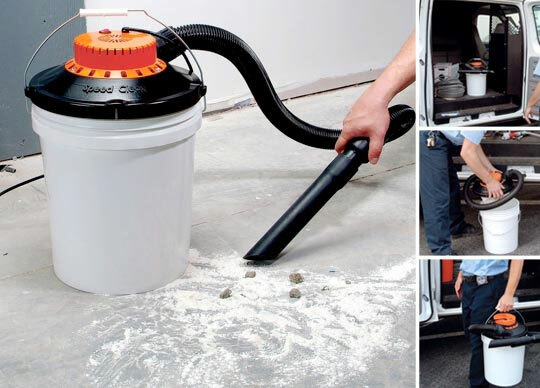 Here’s a contractor’s quality vacuum cleaner that hooks up to a five gallon bucket. By using a handled bucket, you will have a relatively light, portable vacuum cleaner useful for on a construction site. I suppose it could also be helpful if you have dozens of gallons of material to vacuum up in a single day without a disposal option. For more on how it works, see the item listing on Amazon.com. Update: Mackey, one of our readers, has sent in a link to the “Dust Deputy,” which is a advanced vacuum that uses a “cyclonic dust seperator” to save your filter from constantly clogging. And of course, it uses five gallon buckets to capture the dust. It prices out for me at 21.97. It does not appear to come with the accessories shown with the one on Amazon, but some are avaiable.